Nearly seven years after its first flight, Virgin America reached a milestone when it recorded it first-ever annual profit in 2013. It’s been a hard-fought victory for a carrier that was nearly grounded before it launched operations, has been dogged by poor financial performance and seen its strategy constantly questioned and scrutinised. No one would have blamed Richard Branson had he chosen to abandon his long-held ambition to create a US-based carrier bearing the Virgin namesake. Fiercely protectionist opposition to his plans was instantaneous when Sir Richard and his advisors began laying the foundation for Virgin America nearly a decade ago. In some ways the challenges Virgin America needed to overcome in Aug-2007 in order to officially introduce service from San Francisco to New York were not surprising. As the company worked to obtain necessary regulatory approval to operate as a US commercial carrier, incumbent US legacy airlines, most notably Continental, and labour groups pounced on the company’s ownership structure, leading US authorities initially to reject its application for an operating certificate. The US Department of Transportation (DoT) required that the company would need to alter its structure to clearly reflect that it was 75% owned by US citizens, and also argued that then CEO Fred Reid was too close to Sir Richard Branson since Mr Reid was hired prior to US investors taking an interest in the company. During a Mar-2006 interview with The San Francisco Chronicle Mr Reid outlined what is arguably still paradoxical about the airline industry and the chokehold that fears of foreign ownership have on the evolution of the airline business. “There is just something xenophobic about the aviation industry. It's kind of outdated, but it is that way. It's changing slowly. From a structural and business model, it's the most global industry in the world, with the most antiquated capital laws. Try to explain this to a rational person and you would never get there,” said Mr Reid. Mr Reid further explained it was not surprising that legacy carriers were creating some of the fiercest opposition to Virgin America, as those airlines were shrinking and low-cost carriers were growing. At the time it debuted in late 2007, Virgin America estimated that LCC penetration in the US was roughly 30%. 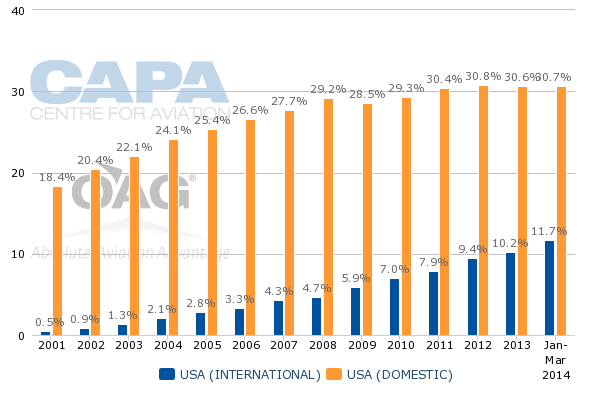 Based on CAPA and OAG data during 1Q2014 the seat share of LCCs in the US reached approximately 31%. The protectionist stance exhibited by US labour groups and some larger airlines during Virgin America's certification process remains in full force – most recently displayed by strong opposition to plans by Norwegian Air Shuttle to operate long-haul service to the US with widebody aircraft registered in Ireland and an operating certificate from the country that allows the carrier to minimise the cost of long-haul operations. See related report: Norwegian Air Shuttle's long-haul business model. "Flag of convenience" or fair competition? Ultimately Mr Reid opted to step down in order to satisfy the concerns of the US government – with strong prompting from industry. He oversaw Virgin America’s inauguration of service and remained as a consultant to the airline after former American Airlines executive David Cush was named his successor. Virgin America’s calculus in approaching the establishment and building of a US carrier appeared mostly logical on paper (as is often the case with new ventures). With the US legacies shrinking, and ample room for low-cost expansion, creating a less-expensive yet differentiated product in major metropolitan markets seemed like a sensible plan. The carrier was armed with roughly USD177 million at its start-up, roughly USD47 million more than the USD130 million JetBlue held when it debuted service in 2000. But just as Virgin America was finally getting its chance to prove its worth in late 2007, oil prices began their rapid climb to historical highs in 2008 and weakness in major global economies was setting the stage for a major economic slowdown. Ultra low-cost carrier, Skybus, which launched operations some three months prior to Virgin America, ceased operations after less than a year, citing fuel and economic conditions as the major culprits for its demise. Around the same time US carriers ATA and Aloha also faded into history as business conditions worsened. Virgin America persevered, albeit with mounting losses as it expanded its network. Even after the carrier convinced US regulators its ownership was legitimate, it still faced challenges two years after launch from Alaska Air Group, a carrier that usually shuns controversy. Alaska openly called Virgin America’s ownership into question as Virgin America expanded into Alaska’s long-standing markets on the US west coast. Alaska and Virgin America compete on service from Seattle to Los Angeles and San Francisco, Los Angeles to San Francisco, Portland to San Francisco and Los Angeles to San Jose. Virgin America is opting to exit the crowded Los Angeles-San Jose market (served by Southwest, American, Alaska, Delta and United) in May-2014. Previously, Alaska Air Group has cited fare pressure on its west coast routes, particularly in the usually lucrative seven-to-13 day booking window. Some of the pricing pressure was no doubt created by Virgin America. 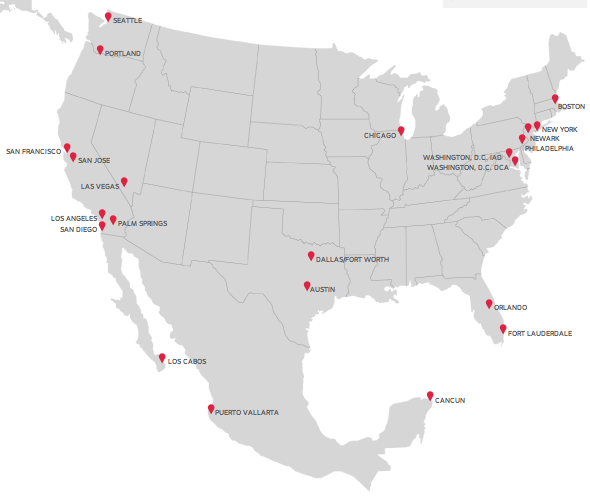 Most of Virgin America’s routes have remained intact as it has grown service to 22 non-stop destinations. It had short-lived service from Los Angeles and San Francisco to Toronto that ended in 2011 and axed service from San Francisco to Orange County John Wayne Airport in 2010. Both routes were eliminated less than a year after launch. The bulk of Virgin America’s markets are in larger metro areas. It does offer transborder flights to Los Cabos, Puerto Vallarta and Cancun, Mexico, giving the carrier some mix of leisure travellers. But as previously reported by CAPA, Virgin America is not dominant in any of the large markets it serves, which could be a factor in the carrier’s poor financial performance throughout its short history until posting its first profit in 2013. Unlike ultra low-cost carrier Spirit, which serves many of the same markets as Virgin America but targets a cost-conscious passenger segment, Virgin America has to compete with large network carriers on the basics including product, price and schedule. Given its size of 53 Airbus narrowbodies, it cannot compete on schedule with the larger carriers and focuses on product and price. In some cases Virgin America has caused some disruption for major carriers. After the carrier introduced service from Newark to Los Angeles and San Francisco in Apr-2013, it busted United’s monopoly status in the San Francisco market. In mid-2013 United warned that Virgin America’s market entry in Newark, and the 20% undercutting of fares that accompanied its launch would negatively affect United’s unit revenues in 2Q2013. Putting Virgin America’s 2013 financial results aside, the disruption it has created for some US carriers has done little for its bottom line. Prior to 2Q2013 it only had a single quarter of profitability, in 3Q2010. The carrier’s fortunes took a positive turn in 2013 as it also posted a profit in 3Q2013 which helped the carrier record an annual profit for the year. Virgin America’s operating profits during the last four years have been strongest during the third quarter, which is during the high travel season in the US. Arguably, the carrier needs to evolve its business to a point where it can achieve net profitability and positive operating income more consistently – especially as it continues to make rumblings of an initial public offering. Throughout its nearly seven years in operation, Virgin America has lived a paradoxical existence. The carrier is a consistent passenger favourite for its onboard amenities and service, but up until very recently has never managed to translate its popular appeal into profitability. With just 6 million passengers carried in 2013, Virgin America still only represents a small fraction of US domestic traffic, which suggests a solid upside for growth. However, it is only when the carrier opted to slow its growth that it finally turned a corner to profitability. Now Virgin America faces an altogether different challenge – sustaining its financial momentum.